How To Find A Lost Dog....This Really Works! Knowing how to find a lost dog is one of the most valuable skills a pet owner can have when a dog goes missing. Is your dog missing? Listed below are the crucial steps to follow to find a missing dog, including an extensive review of a new pet service guaranteed to help find your dog quickly, www.LostMyDoggie.com. As soon as you realize your pet is missing, assemble a team of friends and family and assign each person a job. Working quickly is important, and your best chance to find your pet will be in the first 24 hours of his or her disappearance. The best way to find a lost dog is to create a missing dog poster. The poster should be printed on durable paper, and include a high-resolution image of your dog’s face and any identifiable markings. Also included on the poster should be your dog’s name, your contact information, and the reward, if applicable. Post as many flyers as possible all over town, particularly in areas where dog owners frequent, such as the veterinarian’s office, the dog park, and near wooded areas. Laminate posters that will hang outdoors in order to reduce the chances that the poster is damaged by wind or rain. These two phrases are very important, both on your missing dog flyer as well as via word of mouth. A major risk when losing your dog is that the finder will keep your animal. However, if a reward is offered for your pet – the higher the better – there is more incentive for someone to return your beloved dog. Additionally, even if your dog does not require medication, distributing this information will make it less likely that someone will keep your pet. Dogs that are kept by finders are typically high-value breeds, such as Siberian Huskies, Pit Bulls, Yorkshire Terriers, and other purebreds. As a preventative measure, “reward if found” and “needs medication” can be engraved directly onto your dog’s identification tags. Social media is a great way to help you find a lost dog thanks to the quickness in which information can travel. Many missing dogs have been reunited with their rightful owners thanks to the phenomenon of social sharing and “viral” posts. To use social media effectively, first join local “lost and found” groups for your geographic location on Facebook. Next, create a post that contains a high-resolution photo of your dog, the area in which your pet was last seen, your dog’s name, and your contact information. If offering a reward, don’t forget to include that information as well as any medical conditions your dog may have. Change the privacy settings on your post to “public” so that people can share your information as much as possible. Next, cross post this information on an as many social media outlets as you can, including your personal Faebook page, Twitter, and Instagram accounts. To improve your post’s visibility, use hashtags such as #dogsofinstagram, #lostdog, #dogsoftwitter, #missing, #lost, and #dog. One way to find lost dogs is to go door-to-door asking your neighbors if they have seen your pet. Even if you have posted numerous signs in the area, you would be surprised how often your neighbors have the best information for what is going on in the neighborhood. Take multiple high quality photos with you to show your neighbors, as well as your business card so that they can contact you if they have any information. Many people find their pets in this way, because a neighbor was storing the dog in his or her yard or garage and waiting to be able to take it to the veterinarian to be scanned for a microchip. To find a missing dog you should file a missing dog report with as many local organizations as possible. Call animal control, local animal shelters, nearby rescues, pet stores, doggy day cares, and dog training facilities. Leave a detailed description of your pet, including any identifying markings, as well as your name and phone number. The more people and organizations you can contact, the better the chances you will find missing dog. To find your lost dog you should call all the local veterinarians in your area and describe your pet. If possible, ask your veterinarian to fax your dog’s record to vets in the surrounding area. If someone brings in a new dog or a stray dog they have found, the veterinarian will be your best resource in having your dog returned safely. Hang missing dog signs in the office of every veterinarian in the area, as well. Another tip for finding a lost dog is to make sure your pet’s microchip information is up to date the moment your pet goes missing. Oftentimes dogs with microchips cannot be returned to their rightful owner because telephones have been disconnected or the incorrect information is listed. If your dog doesn’t have a microchip you should consider getting a gps tracker. the technology has come a long way since they were first introduced the market years ago. The Whistle 3 GPS Pet Tracker will not only give you the location of your pet but will also track your dog’s daily activity and rest to keep your companion in great shape for their age, weight and breed. Alert the original owners of your dog, or the shelter or rescue from where you adopted him or her. These organizations can often lend a helping hand in finding your pet. Additionally, it is a good idea to notify these people in case the microchip information goes back to them. Online classified ads such as Craisglist are great resources for finding lost dogs. Post as much information as you can, including your dog’s picture, description, your dog’s name, your name, and your contact information. Make sure to repost your ad every few days in order to keep the information easily visible. Also be sure to check the found ads, as finders may not think to look in the “lost” section of the website. Even if you have filed a lost dog report with the local animal shelter, it is important to physically take a look at the dogs that have been turned in. Remember, a dog’s description is highly subjective, so an animal that appears to have curly black fur to you may be recognized as dark brown, wavy fur to someone else. Every 2 – 3 days walk through the animal shelter in order to make sure your pet hasn’t been the victim of mistaken identity. While this next piece of information might sound obvious, it is absolutely crucial: do not leave your phone at home while you search for your dog. Place your cell phone number on all of the information that you distribute so that you can keep your phone on you at all times. The worst thing that can happen is that someone finds your dog while you are away, and then your dog escapes the home of the finders. How do you find a lost dog? One trick is to think like your pet. 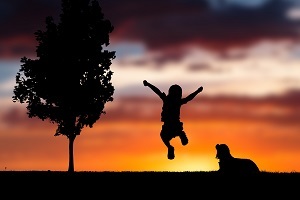 What are the most motivating factors for your dog? Will your pet stop what he or she is doing and sprint across the yard at the sound of a treat bag being shaken? While searching for your pet, pack items that will sound appealing to your pet, such as kibble in a tin can or a favorite squeaky toy. Make plenty of noise in the area your dog was last seen, in case he or she is hiding. One tip in how to find a lost dog fast is to hire a pet detective or dog tracker. Pet detectives have spent years honing their craft in finding lost pets, and often use dogs with highly sensitive noses (such as Bloodhounds) to search the area in which the dog was last seen. Unless your dog is extremely skittish, chances are that he or she won’t go far. Ask friends and volunteers to help you canvass the area by searching every nook and cranny within a few mile radius of your home. Occasionally, a lost dog will become so frightened that he or she will not allow itself to be caught, not even by the owner. In this situation, you may see the dog and know that he or she is staying in one location, but the animal will be evasive. Here, a live trap can be the answer. If possible, first ask a local rescue or animal shelter if you can borrow a trap (and if they can help set it up). The trap will consist of a large kennel or pen that contains food and water. After the dog has entered, the door to the kennel will close, trapping the dog inside. Sometimes, dog become lost in the woods, such as during an off-leash hike or a hunting trip. A tried-and-true method from hunters on how to find a lost dog in the woods is to leave an item behind that smells strongly of your scent (such as a jacket), as well as water (no food, as this may attract unwanted animals who might keep your pet away from the area). Return to the item every couple of hours, replenishing the water if necessary. In most cases, a lost dog will not stray far from the owner’s scent. Think hard about the area in which you last saw your dog. Is there a farm nearby with chickens or cattle? Are there houses in your neighborhood that have free-roaming dogs? Is your dog not spayed or neutered, and is another intact dog nearby? Look to the skies in search of a circling mob of ravens or magpies. If a carcass is near your hungry dog may be attracted to the smell. Lost dogs can wind up in the strangest areas, sometimes even hundreds of miles from home. If your dog goes days without returning, start to look into the surrounding areas. Check the Craigslist, Facebook, and animal shelter ads in these regions. Call the veterinarians and dog rescues as well. If possible, assemble a search party. Keep sharing your social media posts in hopes they will be seen by the right people. While many of the methods listed above have been useful in the search for a missing dog, the fact remains that thousands of dogs stay missing every year, much to the devastation of their owners. With the website LostMyDoggie.com, 85% of pet owners have their dogs returned. If you are unsure how to find a missing dog or don’t know where to begin, this website is a great resource. How to Find my Lost Dog with LostMyDoggie.com? LostMyDoggie.com is a website that not only tells you how to find lost dogs, but puts the plan into action. There are three levels of service provided, with packages starting at $0, $54.95, and $94.95. No matter which package is chosen, pet owners receive expert help from kind and caring individuals who are dedicated to returning dogs to their rightful owners. What is Included in the Free Flyer LostMyDoggie.com Package? • Professionally designed lost pet flyer. All you have to do is provide the necessary information and then a missing pet poster will be created for you to hang up in your neighborhood right away. This service will ensure all the proper information appears on the flyer, and that it will be created in a visually pleasing way that will get noticed. • Professionally designed lost pet flyer will be emailed and faxed to up to 25 nearby animal shelters and veterinarians. When time is of the essence, the last thing you want to do is sit in the house and spend hours looking up the phone numbers and calling multiple veterinarians and animal shelters. This service is completed for you, allowing precious time for searching. Depending on your geographic location, this service typically covers more than a 20 mile radius. • Free lost dog posting on LostMyDoggie.com. Not only does LostMyDoggie.com help you in your search for your pet, but it also is a social media networking site in itself, dedicated to matching people who have found pets with the dog’s rightful owner. When posting your lost dog on this website, you can also upload one color photo for free. • Automatic matching to found postings. Unlike with Craigslist or other classified ad websites, you won’t have to sift through the found ads, just in case someone has your dog. The website will complete this task for you, saving you time and energy. You will receive an email alert when a potential match is found for your lost pet. • Dedicated Audience. When determining how to find your lost dog, finding the right audience is crucial. The people who utilize LostMyDoggie.com are here to help, and accessing this online community can bring your dog home quicker than with other services. What is Included in the Phone Call LostMyDoggie.com Package? • Personalized phone call to your neighbors, reaching 250 – 5,000 homes. A personal message recorded by a human (not a robot) will call your neighbors and provide a description of your dog, your pet’s name, as well as your contact information. If the phone call goes to voice mail, a message will be recorded. This phone call will be sent out within an hour of you placing your order. • Cell phone numbers can be reached. Concerned that your neighbors do not have a landline or are on the Do Not Call registry? LostMyDoggie.com has access to your neighbor’s primary contact information, meaning cell phones will be called. Additionally, LostMyDoggie.com is exempt from the Do Not Call registry, ensuring your neighbors will be reached. • Ensure the calls were made. How will you know your neighbors received this important phone call? You will be able to log in to the database and see a detailed address and call log of all the calls that were sent out. • Plus, everything in the free package! What is Included in the Most Successful Package? • Everything included in free and phone call packages. • Mailed information to animal related businesses. Do not rely solely on the description you gave over the telephone to pet-related businesses in your area when searching for your dog. LostMyDoggie.com will mail a professionally designed postcard to 25 – 300 animal shelters, animal rescues, animal hospitals, and other pet businesses with information about your pet. LostMyDoggie.com’s database includes over 225 million US phone numbers and addresses, ensuring that the proper businesses are reached. • Receive notification that mail was sent. Interested to know which businesses LostMyDoggie.com mailed? You will be able to login to the database to see a detailed address log of the community members that received your information. What are the Benefits of using LostMyDoggie.com? When you are searching for your pet, you are distraught and probably not thinking clearly. Time is of the essence, as the first 24 hours are the most critical in finding your pet. The secret to your dog’s safe return is mobilizing your resources quickly. When you use LostMyDoggie.com you will be able to create a poster, notify your neighbors, and contact local businesses in a fraction of the amount of time you would be able to otherwise. This will help you save precious time and be able to do what truly matters: search for your dog on foot. Oftentimes, good Samaritans pick up lost dogs but are unable to find the proper owner. By using LostMyDoggie.com you have a better chance of being reunited, as the potential person or shelter with your dog will be provided with your contact information. In addition to these useful services, which have an 85% success rate, you will have access to an online community of dog lovers who are dedicated to your cause. LostMyDoggie.com is backed by the ASPCA and PETA, guaranteeing satisfaction with your service. If you are not happy with the service provided, it is backed by a 100% money back guarantee! Being faced with how to find a lost dog is every pet owner’s worst nightmare. However, if you remain calm and act fast, you can greatly improve your chances of being reunited with your four legged best friend. With the tips outlined above and LostMyDoggie.com on your side, your dog will be home in no time! Previous Post My New Puppy Has Diarrhea – What Can I Give Her? Next Post Dog Arthritis: What Can I Give My Dog For Pain?